Whether you realize it or not, there’s probably one color that makes you feel absolutely amazing. One that makes you feel beautiful, confident and happy. Most days you’ll find me wearing stripes, blue jeans, greys, whites, blues and camel. I love those colors, they’re classic and neutral and I can always count on them to look fresh and stylish, but my signature color? I think it’s this color of mustardy yellow. I like to think of it as my color spirit animal… if there is such a thing. The funny part? I actually don’t own that many pieces in this color. 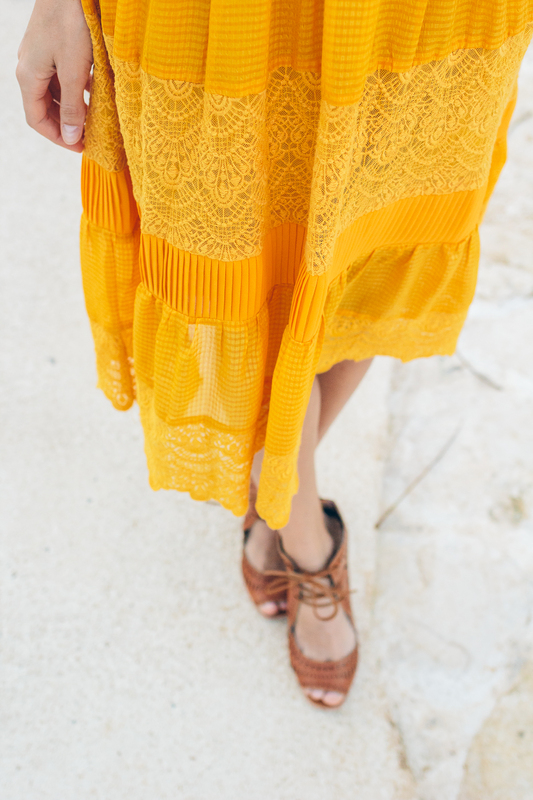 It’s not the easiest color to find, but this dress is the perfect shade of golden yellow. Maybe part of the reason I love it so much is because I don’t have a lot of it in my wardrobe. This color reminds me of summers, warm weather, the beach and simply makes me smile. It transports me to easier, care free days and that’s a magical feeling. I also happen to love the way it looks against my skin, especially when I’m tan! Do you have colors you wear all the time? What is your signature color? BTW, a perfect lace dress for fall, and tie front yellow dress.